There was a lot of chess action in NYC this Tuesday. I left the Kasparov – Deep Junior match about one hour before it’s conclusion to setup this weeks NY Masters. I even took 2 entries at the Kasparov match! Next Tuesday there will be a NY Masters, but Kasparov and the computer have a rest day, perhaps some of the strong players who are hanging around at the match will come by the Marshall to test their skills! Also the NY Masters is running its first ever Round Robin tournament at a slow time control. The field will include 10 players with an average FIDE rating of 2203, with one game being played each Monday night beginning next Monday evening. This is hopefully just the start to more tournaments like this in the future! The webpage for this event is http://www.newyorkmasters.com/1stintl.html, and will be updated after the games each week! 2. J.Shahade – Ibragimov SEE BELOW! 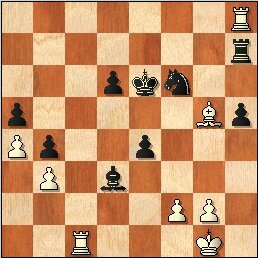 We started off the tournament with a big upset, as Rafal Furdzik, co-champion of last week’s NY Masters, knocked off GM Alex Stripunsky with the black pieces! Altin Cela, the Albanian IM, came back to play this week but met with an unpleasant surprise as Boris Privman took him out in round 1. 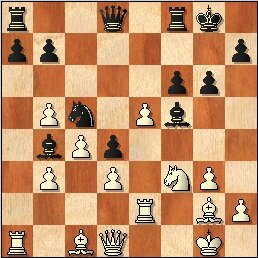 WIM Jenn Shahade was hoping to keep this string of upsets going as she had the white pieces against GM Ildar Ibragimov…. Jenn Shahade is coming off a fine performance in the US Championship, as she tied for first and gained her 2nd IM norm! Strangely her 1st IM norm was also gained in last year’s US Championship. Due to the serious lack of norm events in the USA, American players often have to resort to the US Championship for norm opportunities. After Jenn’s tie for first place, she was forced into a blitz playoff with Irina Krush and Anna Hahn in which Anna emerged victorious. If Irina and Jenn continue to play in the NY Masters on a regular basis, and gain confidence at the faster time controls, it could be a huge boon for their chess, as the time controls seem to be speeding up all over the place! 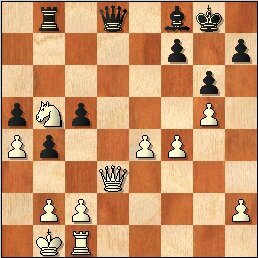 This move is thought to be a mistake, as now white has no great plans of activity, yet black has a very simple plan of …..f5, underminding the d5 pawn. 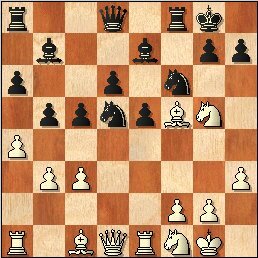 And here is the counterplay, white plans to use the weak square on e6 and it isn’t so simple for black to combat these ideas, especially in an action game. Leading to the win of an exchange.. 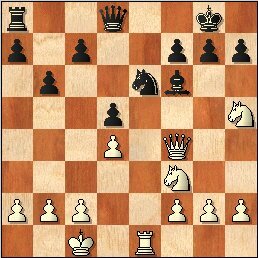 Whites bishop seems short of squares, but fortunately it can always retreat to h5. The expected black move, and most likely the best, was 22….g6, shutting the bishop in. 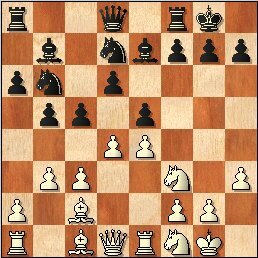 White could always play c4, to secure the d5 square for the bishop, but this would result in the loss of a 2nd pawn. 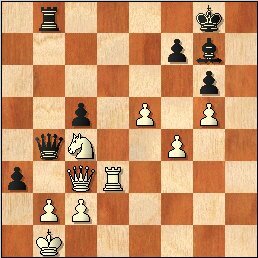 Now white has the advantage, although must play carefully as black does have compensation in the form of strong central control. 33.Rc6! A nice combative move, tying down the black pieces. However at this moment, both players were under 2 minutes (with 5 second time delay) for the remainder of the game…so anything could happen! 2 Vovsha – J.Shahade SEE BELOW! The favorites returned to form in Round 2 as GM Kacheshvili used his powerful light squared bishop on c6, to wreck havoc on Bonin’s king on h1. Krush has had big problems with Furdzik in the past, as she is lifetime 0-2 against him in the NY Masters, however this week she would strike back as she won a piece in an endgame. Despite having to convert this advantage in a mad time scramble, Furdzik’s flag was the first to fall. Boris Privman was a happy camper as his 2 rooks and knight were no match for Gershovs lone queen, and thus he joined Kacheishvili and Krush at 2-0! Now let’s see if Jenn Shahade could continue her groove against the strong 17 year old IM, Eli Vovsha. 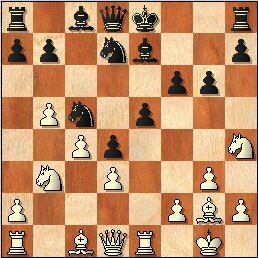 A strong move which really puts the clamps down on black’s position. 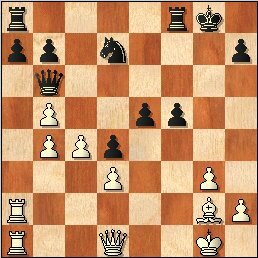 Stronger for black was 16...Rcb8 instead of Rab8. 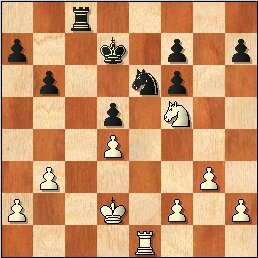 White now has an idea of exchanging all the minor pieces except for blacks dark squared bishop and whites knight on b3. Black’s bishop is restricted by her pawns, thus these types of positions should favour white. Mission Accomplished, although perhaps white didn’t have to rush into this trade, but Eli claimed to be worried about ...Ne5, sacrificing the exchange. 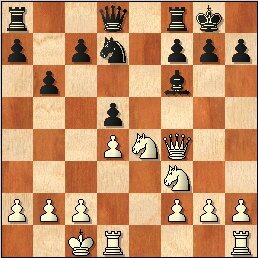 21...Qh3 was an interesting try. The idea is that if 22.Qxf4 Rxc2! 23.Kxc3 Qg2 regains the rook. Now white is beginning to solidify. Black cannot dream of trading queens, as this pawn down endgame would be hopelessly lost. Thus black must retreat…. The move f4, plans an eventual removal of the d6 pawn followed up by e5, which would really imprison the dark squared bishop. 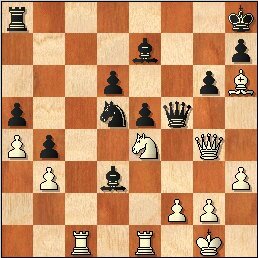 White doesn’t want to capture on d6 immediately as if 28.Nd6 Bd6 29.Rd6 Qg5, and although white is still up a pawn, black has a lot more play than before. What a picture, one could almost remove the g7 bishop from the board! Now white has a simple transposition into a winning endgame. 1 Kacheishvili – Krush SEE BELOW! It was down to 4 players gunning for the top prize after Round 3, and the clear favorite of the bunch had to be GM Giorgi Kacheishvili. Kacheishvili is actually ONE rating point away from being on the FIDE top 100 list. Igor Novikov, whom is one point higher than Giorgi, is on the list at number 99. 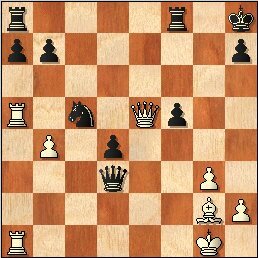 Privman was walking on air with his huge start of 2-0, but Vovsha grounded him well in the 3rd round, taking on Privman’s London attack (1.d4 2.Nf3 3.Bf4) and scoring the victory. Who would join Vovsha at the top….Kacheishvili or Krush?? White has already gained space on the queenside, and now is trying to open lines in the center and the kingside! It looks like black will win this pawn on d4, but Giorgi finds a nice response. This check is the point, now after Ra5 the queen is trapped, as the queen defends the b4 pawn. However black has a trick up her sleeve…. 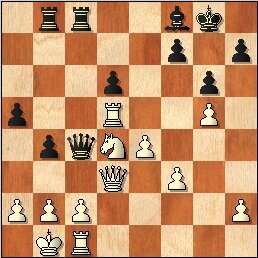 Here is the trick, taking advantage of the pinned b4-pawn, but white has seen further..
And unfortunately for Irina, too many of her pieces are in take. The finishing touch. If 30...Kg8 31. Bd5 quickly decides the issue. 1 Vovsha (3) – Kacheishvili (3) SEE BELOW! This last round would feature two undefeated scores going head to head. One might suspect a short draw, but Eli told me that he doesn’t come to these events for the money but instead for the competition. Also it really helps to promote chess when players fight hard in last round situations like this, as there was a lot of recent controversy after the many last round quick draws in the US Championships. I was very glad to hear his sentiments and looked forward to an exciting last round duel. Other big news in Round 4 was the end of Bonin’s curse! Bonin has lost an unbelievable 20-25 consecutive games to Alex Stripunsky. Despite the 200 point rating gap, a result that dominant is nearly impossible to achieve against a player as strong as Jay. Anyway Jay pulled out the victory and now the streak has finally ended! This is definitely the type of move one would play, if one wanted to fight on. 13. 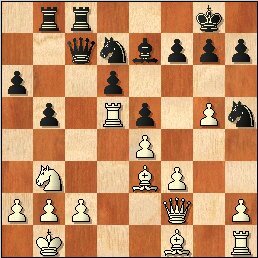 Nxf6 probably leads to a small edge for white, but not enough to have any serious chances to win against someone of Giorgi’s caliber. However most of the strong GMs and IMs who were observing on ICC preferred Nxf6 over Ng3. At this point Giorgi offered a draw, but true to his word, Vovsha fought on. To be honest white is the only one with any chances in the resulting endgame, due to the new weaknesses in black’s pawn structure. So we have arrived in this endgame, and although most people still thought white had the advantage, one strong commentator (A VERY strong GM) thought that although white is still better, the result should be a draw. Vovsha no longer knew how to make progress and would suffice himself with the $260 he would receive splitting 1st and 2nd. This decision is understandable as he had a time disadvantage of about 8 minutes to 18 at this moment. And so there we have it, IM Vovsha and GM Kacheishvili are co-champions of the 41st NY Masters. Tying for 3rd place were GM Ibragimov and IM Bonin. This was a real fighting event as out of 26 games we had a grand total of just 2 draws! Next week we have our first ever WILD CARD WEEK, so that should be very interesting. Also I plan to jump back in the mix, and even Canadian Champion Pascal Charbonneau claims he will come down and join the party!